It's very convenient to run another PC from your current PC. 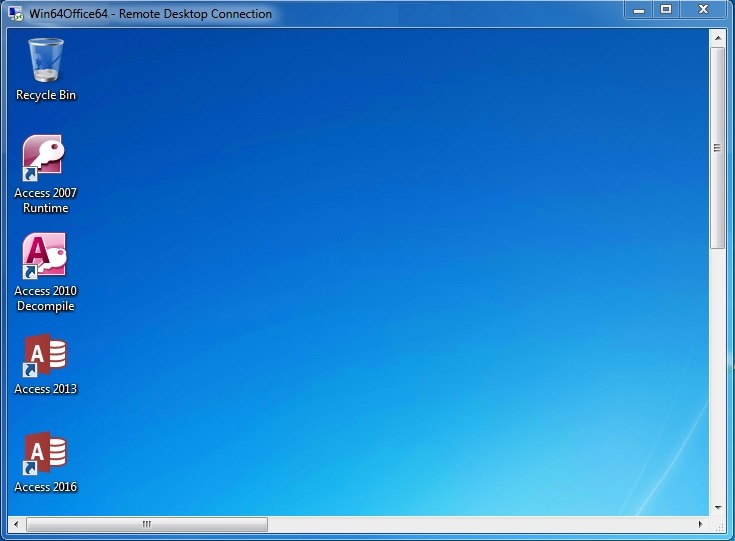 Whether it's another machine in your office, network, or physical location, Windows offers a Remote Desktop Connection feature to do so. From offsite, run the PC in your office (or network). You can run it as if you were onsite with the benefit of the speed of your internal network rather than data coming to your PC over your Internet connection. You will need VPN authentication to connect to your network. Offer PCs with Windows applications that people can run without having to install anything on their PC. 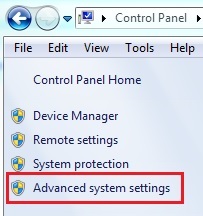 This can avoid the issues with installations on individual machines, conflicts with other programs, Windows updates, etc. Support any Windows application including Microsoft Access, Visual Basic 6, .NET and legacy apps for any user including Macs. For servers, one can use Terminal Server to support multiple users at the same time. Read our paper Using Terminal Services and RemoteApp to Extend Your Microsoft Access and other Windows Applications Over the Internet for more details on that. 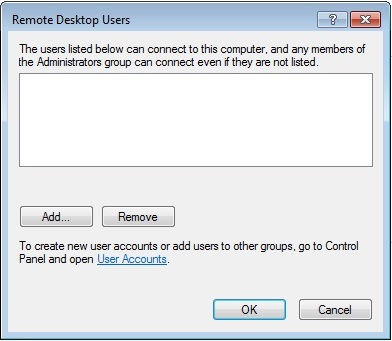 For this article, we're covering the standard Windows O/S that allows one user to run it at a time. 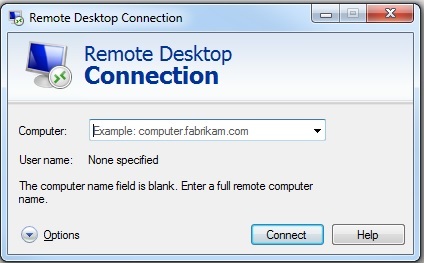 To enable this feature, the PC needs to allow remote desktop and specify who can connect. You can press the Windows Key and R to open the Run Window and enter sysdm.cpl [Enter]. The machine is now set to allow another PC to log into it and run it. Enter the name of the Computer we saved earlier and press [Connect]. You'll need to enter your login credentials the first time. 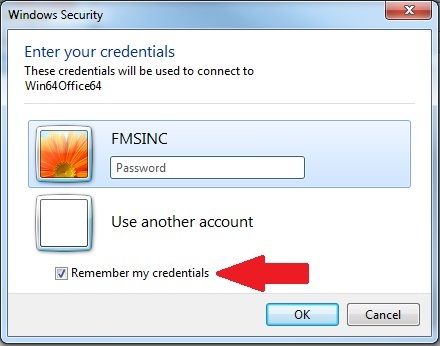 Check the "Remember my credentials" box so you won't need to enter it every time you connect. There may be some problems when you try to connect. 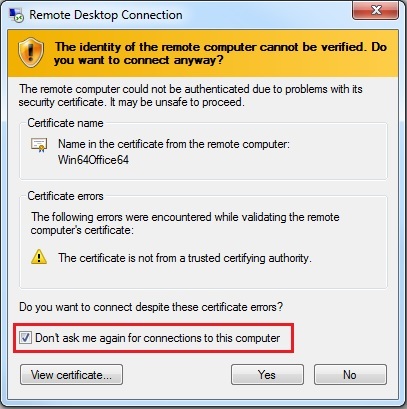 If you encounter this error, it usually means the remote PC was setup on the network before the current domain trust system was updated. To fix this by updating the remote PC's network connection. 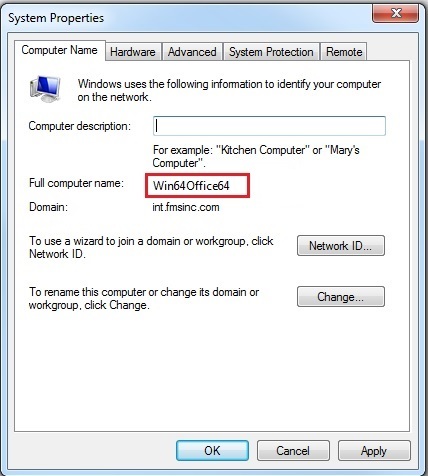 Go back to the Computer Name tab and press the [Network ID] button. Just step through the Wizard to refresh it. Avoid seeing this again by checking the box "Don't ask me again for connections to this computer"
You can maximize it to full screen and it'll feel like you're on that computer. The only difference is a connection bar (moveable) that appears at the top to identify the remote PC. 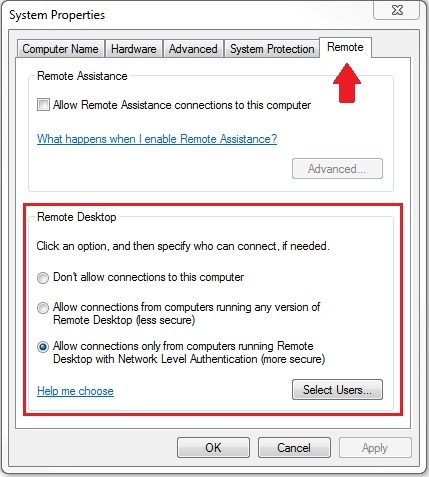 Note that unless the PC is a server O/S, only one user can remote to it at a time. 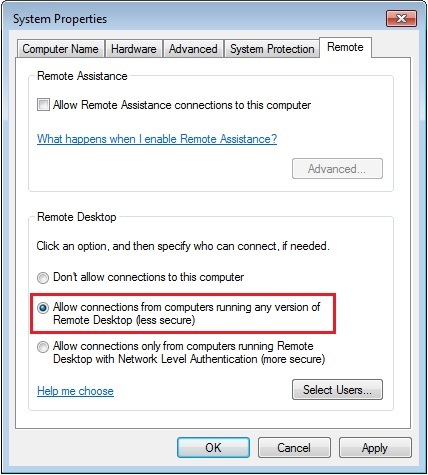 If another remote session is running, that user is kicked out when you connect. To support multiple simultaneous users, setup Terminal Services with RemoteApp. Having multiple monitors on a PC is a huge productivity booster; people usually connect remotely in just one monitor. Fortunately, there's a feature to let you also use multiple monitors remotely. If you have two monitors and the PC you're connecting to has two, you can run both monitors remotely as well. 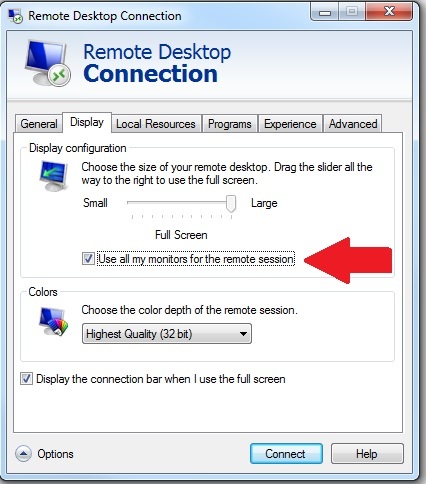 Click on Options, go to the Display tab and check "Use all my monitors for the remote session". Note that the Display tab also lets you set the screen resolution if the remote PC is using a different resolution or screen size than your local monitor.